Thundercats was one of the biggest hit cartoons of the eighties. A cartoon which contained futuristic technology and alien worlds, merged with the fantasy of ancient evil and monsters. This show was close but quite different than He-Man and still remains a favorite amongst eighties nostalgia fans. Following up the 130 episodes was a incredible line of toys produced by LJN. The figures stood at a average of 5" tall and well represented each character from the series. LJN produced 3 main series of figures, with many side action figure series with a total of 37 different figures. All cast characters of both good and evil were produced. 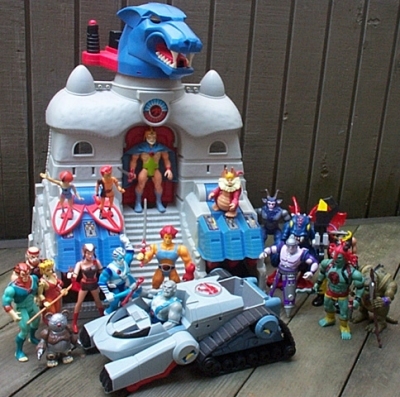 This included everything from the honorable Thundercats team to the vile Mutants and Mumm-Ra. Many of the characters who appeared only a few episodes were also produced. This included the Beserkers, Rampagers and even Safari Joe. The most sought-after figures are from the last series. These characters are Jaga, Ben Gali, Pumyra and Lynx-o. Each figure was jointed at the neck, arms and legs. LJN did not hold back on their extreme detail of sculpting, allowing each figure to look exactly like the character from the show. Almost every figure had a "Battle-Mattic" action which was a lever in the back which when pressed, the figure would move their arm. Other figures had options of spinning or lighting up. Accompanying the vast action figure line was many vehicles, accessories and monsters. LJN produced 2 playsets, 6 vehicles, 6 accessories & 2 monsters. Of these, the most famous pieces are the Thundertank and the Cat Lair. Most of the other ships appeared in the series while others were created by LJN. There are also 2 other ships called Shuttle Guns that PlayFul created that never appeared in the show. The toughest and most desired pieces are the Cats Lair, and the 2 monsters of the Astral Moat Monster and Tounge-A-Saurus. Other toys and items were also produced with the 5" series. A 2" series of figures was produced with playsets. Burger King also ran a Kid's Meal which featured various Thundercats pieces. Eraser, Cake Figurines and more were also produced, keeping a collector busy hunting for quite awhile. One of the most interesting things about this line is that it was cancelled so early, and LJN had planned many more figures and piece to be produced. These unproduced prototypes were so close to production, that they were featured in catalogs inserts with the toys. The unproduced figures were the entire team of Lunatacs and two more Beserkers. Unproduced ships and vehicles included the Feliner, Luna Tacker & Thunderstrike. Many other unproduced pieces were pictured and slated, and were never released. Most modern action figure collectors find this line to be one of the best to collect. Collectors are often still searching for the toughest pieces for their collection, like the Cats Lair, the Monster, Jaga and Ben Gali. But the toughest and most expensive pieces are the carded gift set packages of Lion-O with Thunderwings and Mumm-Ra with Luna Lasher. But the hunt for me lies in the Mad Bubbler, which I desperately need! Make sure to visit Alex's website The Toy Archive for more information on rare and unique toys from the 70's, 80's, and 90's .